Caption During the carnival this year from 10th to 20th February town streets and squares will be enlivened by numerous and extremely varied carnival mask coming from the entire country and from Europe. The eleven days that is the official duration of the carnival called Kurentovanje will resound with music and dancing rhythms records will be broken the most beautiful and original carnival masks will be awarded Kurent groups will be on stage as well as other masks while social gatherings and parties will be accompanied by famous Slovene and foreign music groups. Excellent local wines and traditional "Ptuj chicken" will abound. 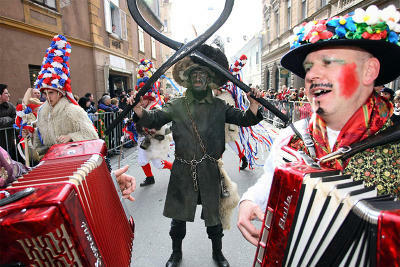 Welcome to the 47th traditional Kurentovanje in Ptuj and experience for yourself that the carnival is the best in Ptuj.